This morning I woke up excited. 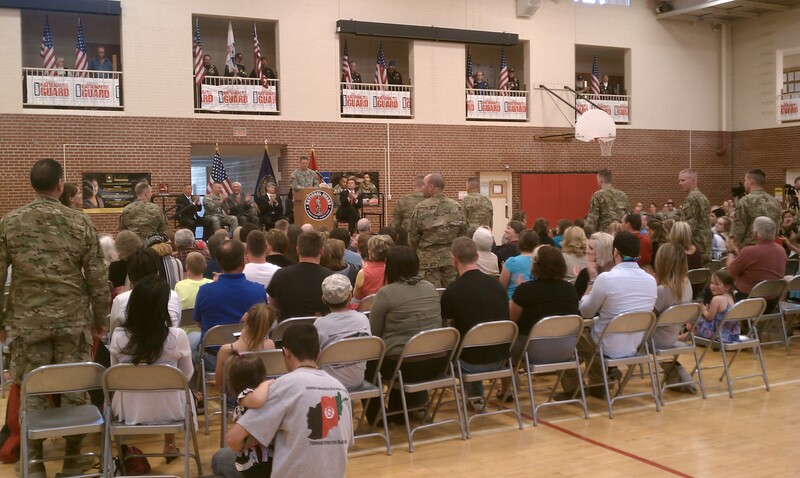 Today the Nebraska National Guard Agribusiness Development Team 3 (NE ADT3) would be reunited with their families! I found myself going back 10 months ago to the day after Memorial Day 2012. 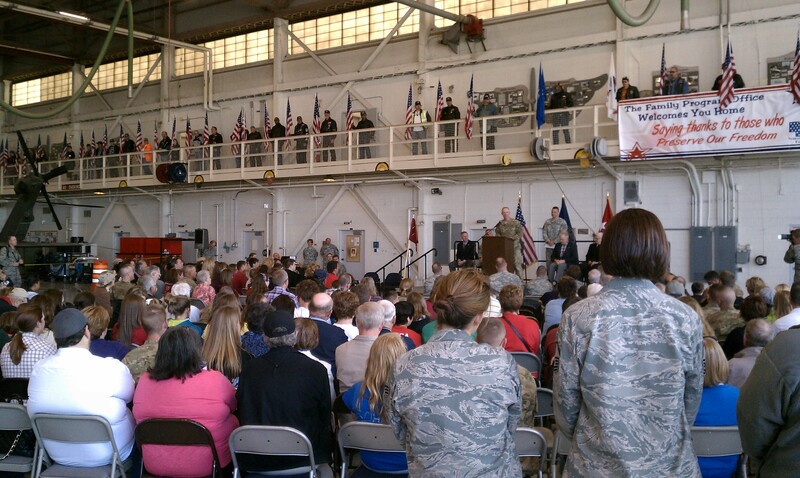 That was the day several of us were reunited with our soldiers and airmen from NE ADT2. Today I was remembering bouncing up and down while holding hands with other military spouses watching the bus with our military members pull up. I remember seeing my husband get off the bus and running to his arms. I remember that even amidst all the family members and friends gathered that day, the military members were always gravitating towards each other-looking for each other. Sure, they were excited to be home too….but their best friends….their battle buddies who they’d spent the past year with was who they felt most comfortable with at that moment. We truly are so blessed in the U.S.A. and take these blessings for granted everyday! As I drove to the welcome home ceremony today, I thought back on this post and how I left many of you hanging about what happened next. Honestly, I’ve started many draft posts but struggled to know what to write or really what to share. Many think that once our military members return that all is right in our world. But the reality is that while there’s a honeymoon period, there’s also a great deal of hard work to make reintegration occur. You see, military members and their families have been living in two different worlds the past year. My husband and his comrades were living in similar to Biblical times working with great people but yet always had to be on guard for the enemy. I was living in a fast-paced techno-savvy world trying to hold everything together here. We both were fortunately forming bonds with military buddies and spouses that will last a lifetime. I was safe at home with my dogs. He and some of his comrades had close calls with death. what it was like for him to leave home and everyone he loved to serve a Country that he loves and was willing to lay his life down for. To work as hard as he could so he could go to bed exhausted in hopes of not missing the home he loved so much. He will never know what it’s like on this end…to have everything in our home remind me of him, to spend endless nights and go to countless events alone, to hold my breath at every bit of news I hear from overseas, and to continually say silent prayers throughout the day for all our military members and their families. But these are the sacrifices military members and their families are willing to make to defend the cause of freedom. We love this Nation and are so proud of and thankful for those who are willing to defend her! Since the deployment, I learned that it was hard for him to want to connect with home and me. His coping strategy was to not connect so he could focus on the mission and not think about home or worry about how things were going here. (He now would never recommend this strategy to any military member!) My coping strategy was to send him letters and packages-to show him he was loved and missed. But lack of communication is hard on a marriage and it takes time to re-build that. I would say for many military couples, reintegration is even harder than the deployment and separations themselves. We all have good intentions for a good reintegration…we learn what to watch for and have resources available to help…but the reality is that we’ve been going two different directions for a period of time. It takes work to bring those lives back into the same direction again. But it’s worth the effort! One way that helped us get away and start communicating again was to attend a Family Life Weekend to Remember Event. There are discount rates for military members and their spouses and there are special locations where there are military emphasis breakout sessions for military couples to talk about military specific issues such as deployments, separations, addictions, etc. It really helped us to start that conversation again and I would encourage any married couple to attend one! I see my husband going through his Afghanistan pictures with the sweetest smile on his face. I know he misses it…he misses the daily work with his buddies and the difference they were making in the Afghan people’s lives. My husband took lots of pictures and video with his helmet cam. As he shared his stories, I realized how much I take for granted. His buddies and us wives have also often gotten together as the guys have spoken at various events. Those are good things-things I will continue to encourage. I’m so thankful God allowed my husband to be on that deployment with great leadership and friendships. I know he’d go back in a heartbeat-especially if he could go with the same people he served with. I think of these Agribusiness Development Teams’ mission to provide for a sustainable Afghanistan…to teach the people how to feed themselves and provide for their families…of the successes that have been achieved. I’m praying for a sustainable Afghanistan and hope that one day-maybe in 10 years-my husband and I can both go and see the places he was, meet the people, and hear the stories of how their lives were changed as a result of our brave men and women serving. For this Veteran’s Day, my wife asked me to write my thoughts on being a Veteran. I have served in the Nebraska Army National Guard for seven years now, and it has been a great opportunity to build myself as a person. I have been able to improve leadership skills, physical fitness, planning, self defense, and many other aspects. 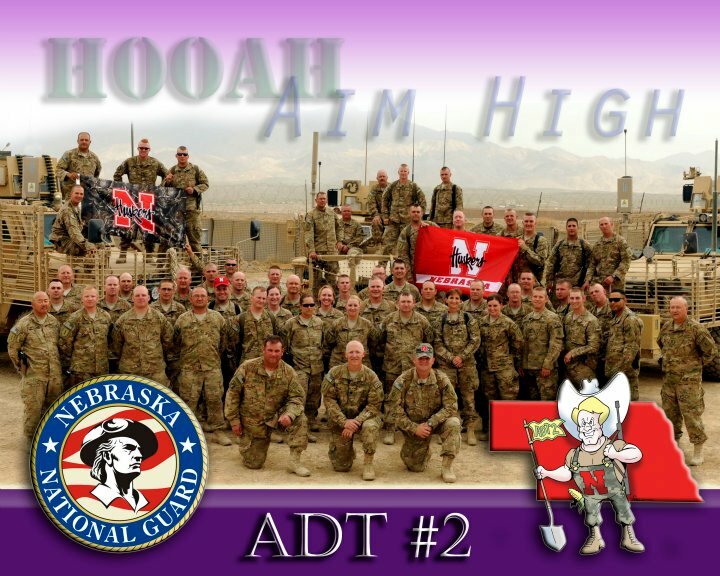 I had the honor of serving with Nebraska Agribusiness Development Team Two (NE ADT 2) in Afghanistan from June 2011 through May 2012. It was an incredible experience helping subsistence farmers improve their livelihood. We worked with Afghan government officials to develop projects in agronomy, livestock, forestry, watershed, beekeeping, and education. Our efforts allowed to make many friends among the Afghan population which I will always cherish. One of the best experiences from my deployment was the friendships I made within our unit. When you start training together you form a cohesive bond. And when you arrive in a combat zone, that bond let’s you know that you have someone covering your back. You share experiences and hardships together that normal civilians can’t fully understand. Living so long away from families can be a definite struggle, and in essence you become one big family away from home. There are the endless days of hard work, long walks to the chow hall, lack of privacy, frustrating rules, and the thought that somewhere outside the wire are people that want to kill you. You become frustrated, and can’t wait to get away from it all. And then when you finally come home, there are times when you miss it and wish you were back with all your friends. As a veteran, there are times when people will thank me for my service and I am not sure how to respond. I don’t think of myself as a hero, I am just fortunate to have the opportunity to do something I love to do. I have gotten to experience some situations and travel to locations I would have never seen if I was not a member of the military. I have been able to build my skills, and lead Soldiers while setting an example for those under me. And most important, I have made many valuable friendships that I will cherish for the rest of my life. On this day of remembrance, I say thank you to those I have had the opportunity to serve with, those who served before us, and those who are still in harm’s way. We are forever indebted to our military members, from those who fought for our independence and freedom from England to those who are still in the hostile terrain of Afghanistan. They have provided security and provided hope to countless Americans. God bless the United States of America. You can also check out this Webinar from Vaughn Hammond, UNL Extension Educator who served with NE ADT2 and tells more about the NE Agribusiness Development Team Mission from his perspective. During my husband’s deployment, I came in contact with Luke Heikkila, a producer for Twin Cities Public Television. 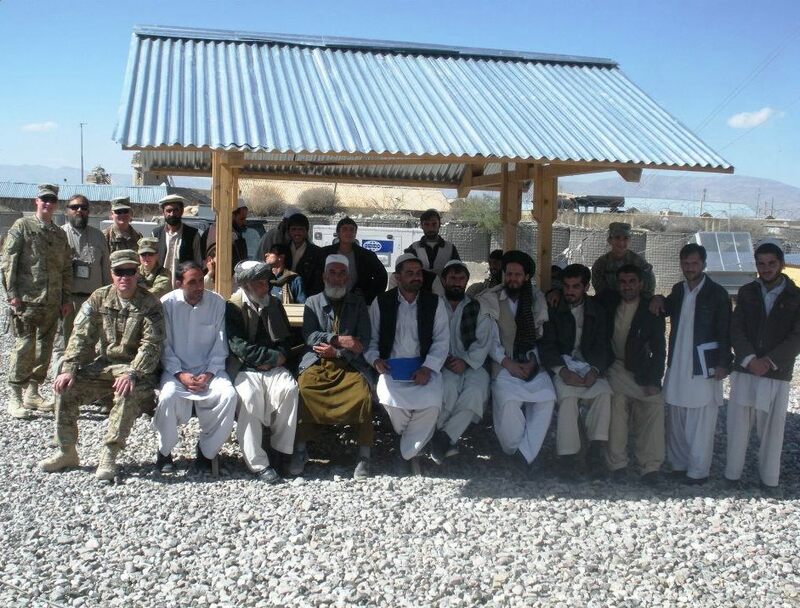 Luke embedded with the Minnesota National Guard Agribusiness Development Team in Zabul Province Afghanistan for a few weeks in order to tell their story of the great work they have done in helping the Afghan farmers and the Afghan people. Below is the link to Luke’s documentary which can be watched in half an hour and really provides a great perspective on the work our soldiers are doing on these teams and the goals of their missions. I hope you take time to watch and thank you to all our military members for your service to our Country! September 11, 2001. A day that many of us won’t forget what we were doing when we heard of the first plane crashing into the World Trade Center. I reminisce about what I was doing at that moment in this post from last year. Today I’m praying for the families who lost loved ones that day. I’m praying for the families who have lost military members who answered the call to defend our nation after that day. I’m praying for the military members currently serving overseas and for their families who are separated from them this day. I’m thankful that God allowed my husband to return to me safely. This past year, there wasn’t a day that my husband walked out of his living quarters over in Afghanistan where he didn’t think about 9/11/01. The qulat where it was believed the 9/11 attacks were planned stood on his FOB (Forward Operating Base) just outside of where he slept. Every day he said he looked at it and it reminded him why he was in Afghanistan…why he originally decided to join the Army National Guard and serve. During the deployment, I received several questions from people. One of them which occurred more than I care to admit was, “What are we even doing in Afghanistan?”. To which I responded, “Have you forgotten about 9/11?”. Sometimes deep down I would be upset…upset that we can so quickly forget the attack on our nation and the lives lost that day while the members of our military bravely put their lives on the line daily for us and our freedom. Sometimes in the business of life I would just stop and look around…people rushing around going about life as if no war was even occurring. I wonder if that bothers those who return from war or if they view this as they’ve done their job so that we can continue on with our lives? Those of us at home with loved ones away never forget; we may still be busy but we never forget. Yet I tried to channel that upset feeling to one of thankfulness…Thankful to all who have and are serving to continue to keep this great Nation free. Thankful that we don’t have to experience what it’s like to have bombs going off daily on our home soil; I think often of the children in Afghanistan and Iraq. Thankful that we can go about a daily life without having to sacrifice much of anything. I think that’s what we’ve lost in this war. The ability to know what it’s like to sacrifice in order to contribute to the greater good like the Great Generation did during World War II. Ultimately I’m thankful to live in this Nation created under God, thankful for our freedom, and thankful for those who continue to protect this freedom! May God bless America and may we never forget 9/11/01! 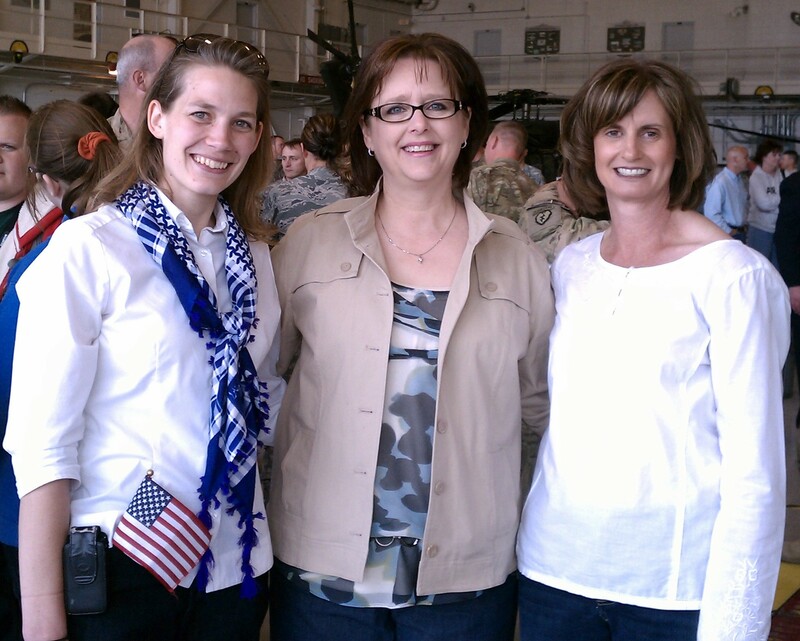 Homecomings and Sendoffs-common functions in the lives of military families! Both are filled with patriotism and emotion. Friday was the homecoming for 46 members of Agribusiness Development Team (ADT)2 who have served nearly 10 months in Afghanistan. Twelve members remain in country to complete the mission and ensure a successful handoff to ADT3 which had their sendoff today. I have the opportunity with UNL Extension to have gotten to know members of both these teams before they deploy as UNL Extension, NRCS, USDA National Agroforestry Service, and the U.S. Army Corp of Engineers have all be involved with providing agricultural training to these teams. Building those relationships has been key for building trust for reach-back regarding questions when these teams are in country. 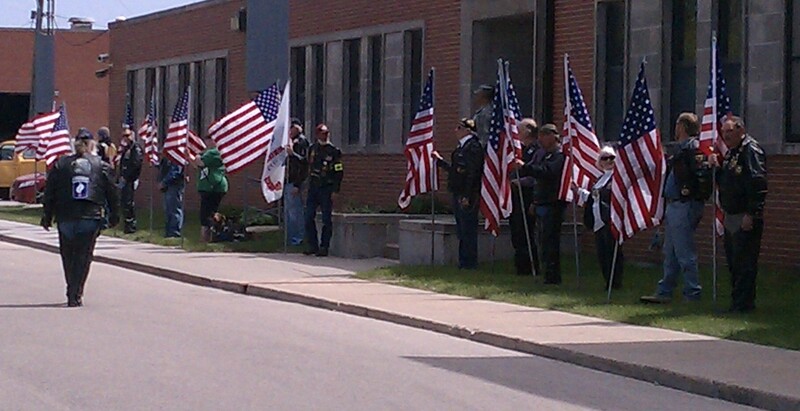 was blowing such that the flags were completely unfurled. That site alone brought tears to my eyes. 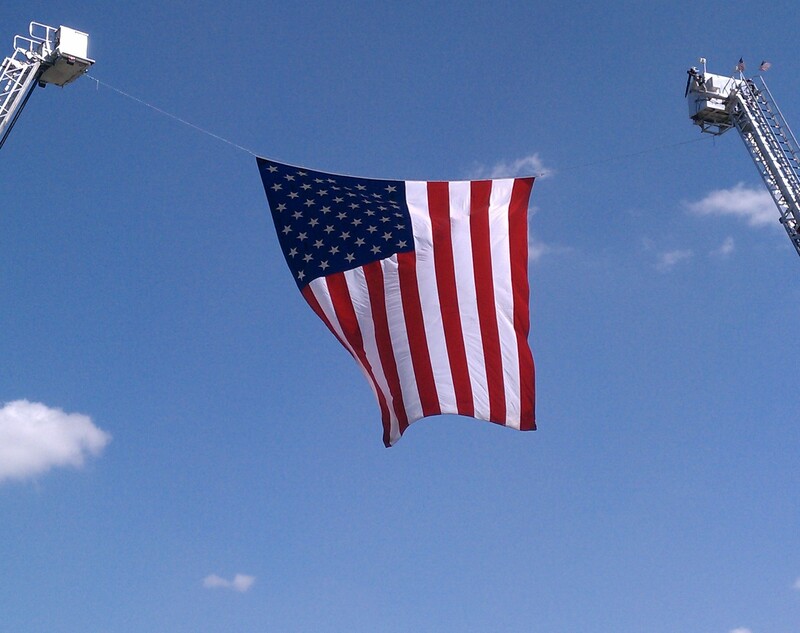 I still feel our flag is one of the most beautiful things in this world! Knowing it would be a tough day anyway, I stood in the background trying to capture photos and video to share with the team members and families later. 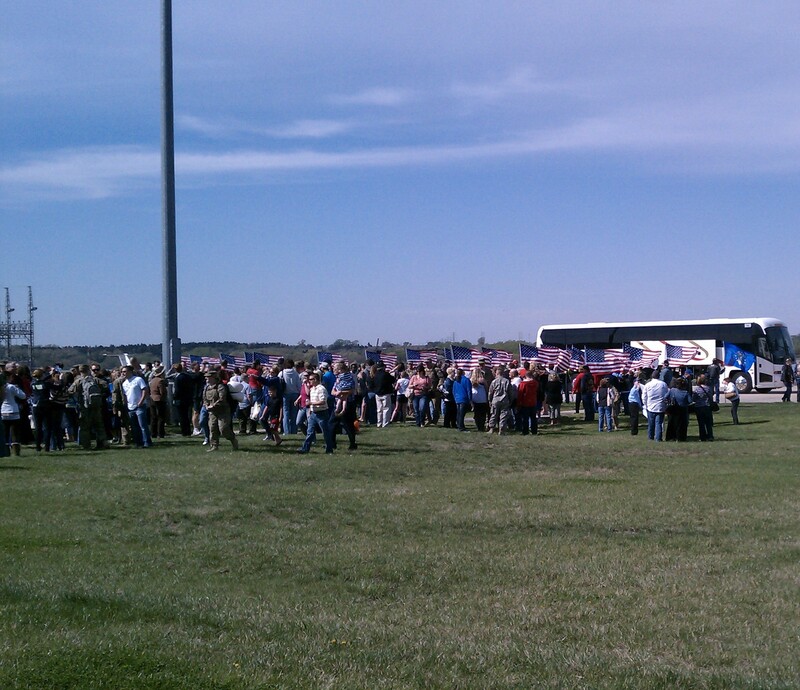 The busses pulled up to families and friends flocking to greet the soldiers and airmen. A plane flying overhead resulted in an eruption of cheers from the crowd as the soldiers and airmen debarked the busses and walked down the crowded sidewalk of cheering and anxious family and friends. It was a beautiful site and the few of us who came to support the unit whose husbands remain in Afghanistan were so happy to see these families reunited. A few tears welled up in our eyes but our pride for our Country and these soldiers and airmen allowed us to suppress the tears and be joyful for the families. Today as I attended the sendoff for ADT3, again I observed mixed emotions. Changes have caused for restructuring of that team as well and some were disappointed they were unable to deploy at this time. Family members were fairly upbeat and showed their pride for their soldiers. I was excited for the opportunity to say one last good-bye to the team I had gotten to know during training, meet their families, and assure them we were here to help with reach-back however we could. While I hadn’t thought about it, maybe the sendoff was also helping me realize that my soldier will Lord willing soon be home as well. These ADT missions have been key for helping the Afghan people become sustainable and feed their families and in training and mentoring the Extension and University people in Afghanistan. 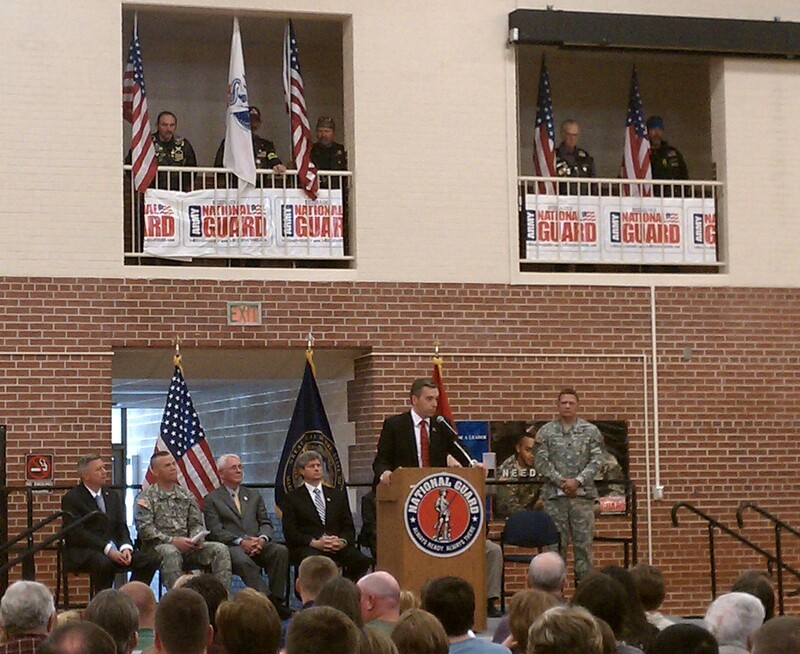 I’m so proud of and thankful for our soldiers and airmen for their work on these missions! This is a blog I have enjoyed reading; the author will be embedding with a Minnesota National Guard ADT team in April. Good lesson here of stepping back and understanding why people do the things they do before implementing a change that although may be beneficial in one component, may not have the desired effect in the long run! As a television producer every once in awhile I take a step back and realize my job allows me to experience so much more than most. Don’t get my wrong, my days are typically not packed with the sorts of things I’ve been writing about as I prepare to embed with the Minnesota National Guard’s Agribusiness Development Team (ZADT) deployed in Zabul Province, Afghanistan. During my more typical productions I am not preparing for travels to a war zone, most of of the time I’m not thinking about body armor, Visas or nearly 15,000 round trip miles of travel. I do, however, routinely get the opportunity to meet very passionate, smart and inspiring people. Today was no exception. One of our favorite movies or series is Band of Brothers. In fact we watched it again when my husband was home on leave. I don’t know what it’s like to experience the strong bond formed between individuals during war, but I do know I am thankful for the close friends he has developed during this deployment. Here are some pictures of friends. With the Super Bowl being this weekend, I thought what better time to write a post on Food and another one on Friends! So here’s the food post. Someday I hope to try some of these yummy-looking Afghan dishes! There were so many amazing pictures of the landscape/scenery that I will share more here! The landscape of Afghanistan appears beautiful…from vast emptiness of flat ground or majestic mountains to lush green cropping and forested areas. There are so many photos to share that I may need more than one post. I don’t know locations of where most are taken so while not many descriptions, enjoy the photos from this beautiful country!